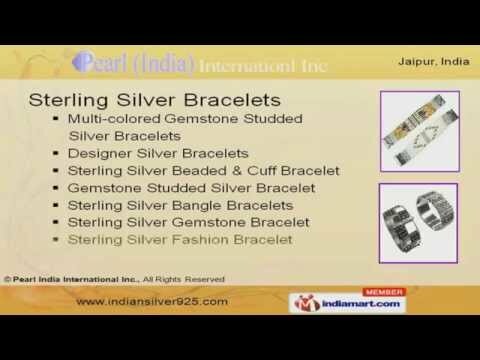 Welcome to Pearl (India) International Inc., we offer Indian silver jewelry with a difference. Manufacturer and Exporter of Jewelry. Established in the year 1993, we provide jewelry with admirable and attractive designs to various clients across the globe.We provide a wide gamut of superior quality product at competitive prices for your princess. Our product range includes Beaded Necklaces, Hanging Beads, Sterling Silver Necklaces, Earrings, Pendants & Bracelets. Our Sterling Silver Pendants bear elaborate designs which are artistic. We offer Designer, Gemstone Studded and Fashion Bracelet under Sterling Silver Bracelets, designed with perfection with stunning looks. Our Sterling Silver Necklaces & Earrings with great charm and shine can enhance the beauty of your Queen of Hearts. Silver Blue Topaz, Rhodolite Garnet and Silver Amethyst under silver gemstone rings will complement your loved one. Gemstone Beads, Sterling Silver Choker and Beaded Necklace are sophisticated and have class of its own.